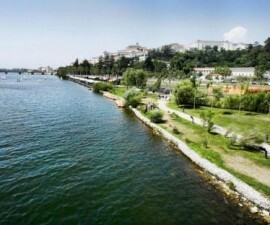 Coimbra is one of Portugal’s most famous cities, both as the seat of the first Portuguese royalty and as the home of the Europe’s oldest university. The city’s roots, in fact, date back even farther. It was a thriving town before the Romans arrived in the second century BC and went on to become one of the most important cultural and administrative centres of the Roman Empire on the Iberian Peninsula. Thanks to its long and varied history, the city of Coimbra is a rich treasure trove of historical attractions just waiting to be discovered. Wherever you go, each corner you turn, something new (or perhaps we should say something very, very old) awaits for your visit. 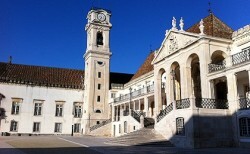 Most visitors keen to discover Coimbra’s historic attractions head to the old university campus of the old town to begin their tour. Founded by King Dinis in 1290, the old university, in fact, began life in Lisbon, but was transferred to Coimbra in 1537, prompting the construction of a plethora of buildings to accommodate the growing faculties. Perched on an elevated position on a hill that slopes up out of the city, the university today occupies a huge space within the city and is a point of reference for visitors and locals alike. This is a place to come and wonder through the streets and squares, admiring the architecture and allowing yourself to be transported back through more than 500 years of Portuguese political, cultural and academic history. 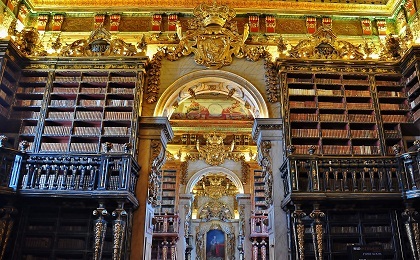 Must-visit locations within the old university for anyone with an interest in history include the Biblioteca Joanina, with its ornate décor and collection of over 250,000 rare books, the Sala das Armas, and the Sala dos Capelos. No visit to the Biblioteca Joanina is complete without a trip downstairs to the university prison! 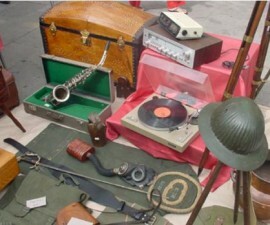 The Sala das Armas houses an interesting display of weaponry, some of which is still used today for ceremonial occasions; and the Sala dos Capelos is the Grand Hall, where most of the ceremonial activities take place. 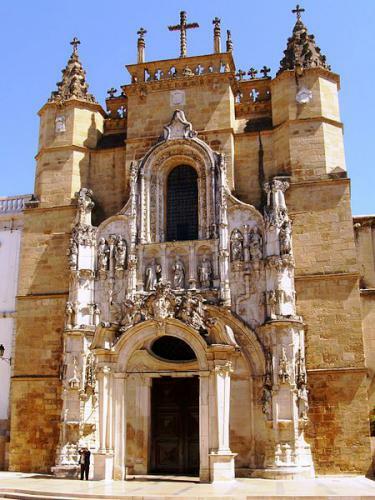 Heading back down the hill to the banks of the River Mondego, a visit to the Santa Clara-a-Velha Monastery is a must. 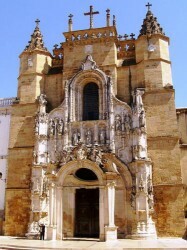 The Santa Clara-a-Velha Monastery is a Gothic building which was founded in the 14th century and was the original resting place of Queen Elizabeth. It was abandoned in the 1600s due to persistent flooding, but has been painstakingly restored over the course of more than a decade. 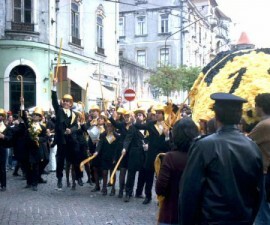 Praca 8 de Maio makes an interesting stop right in the heart of the city centre. This is home to a number of interesting buildings including the town hall, the must-see Santa Cruz Church and the famous café Santa Cruz, which has been a meeting place for academics and intellectuals since it opened almost 100 years ago. Located in the centre of Praça 8 de Maio, Santa Cruz Church is one of Portugal’s national monuments and a National Pantheon, designated as such for its Romanesque and Baroque architecture and because it is the burial place of the first two kings of Portugal — Afonso Henriques and his successor, Sancho I.
Don’t miss the chance to explore inside the church, where you will find a fascinating array of beautiful ceramic tiles, statues, stonework and glass, all of which combine to set off the architecture to perfection. To complete your tour of Santa Cruz history, take the time to stop at the Santa Cruz café for refreshments. Set in a former ecclesiastical building, it boasts high, vaulted ceilings, heavy marble-topped tables, comfortable leather seating, outside tables and the colourful chatter of visitors, locals, students and intellectuals from all over the world. 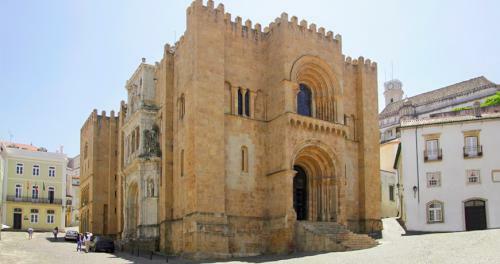 No tour of Coimbra’s historic attractions would be complete without visiting the Old Cathedral. Located in the upper area of the city, amongst the steep, narrow streets, the Old Cathedral dates back to the reign of King Afonso Henriques, following his declaration of Coimbra as the capital of the new Kingdom of Portugal. The cathedral is built in the Romanesque style that was prevalent of the time and is one of the most important of its kind in Portugal. 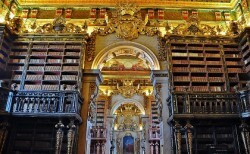 It was designed by French architects Robert and Bernardo alongside the Portuguese master, Soeiro. A range of styles are intermixed with the Romanesque, including Islamic influences, Renaissance decoration and Gothic arches. Take your time during your stay in Coimbra, Portugal, to explore and discover the exquisite array of such buildings and monuments and learn about Portugal’s cultural and historic background.